Whether you’re an experienced filmmaker or just starting out, we’ve got some great video editing software choices for you. Apple’s Macintosh platform has traditionally been the operating system for “creatives”, and video editing software has earned a place as one of the top tools in the armoury for creators of digital content. With the bulk of today’s filmmaking having moved to a digital format, video editing software is an essential ingredient of the pre- and post-production processes. Outside the mainstream movie industry, there’s a need for video editing software in the preparation of complete films and clips for commercial purposes, presentations, private use, and internet content. In this article, we’ve assembled four of the best in video editing software for Mac. We’ll discuss performance, feature sets, pricing, and usability. All the applications described in this article have a free version so you can test them out before making your choice, and all featured programs are available to download right here at FileHippo. Sit back and relax – we’ve found some of the best video editing software for your Mac. With the wealth of video editing software currently on the market, it’s easy to get lost or confused amongst all the bold claims being made about the gosh-wow special effects tools on offer – most of which you’ll rarely have realistic use for. So that’s the first stage in setting your criteria for selecting the software – i.e. deciding what tools and features you will actually need to perform the video editing tasks that you’ll routinely be doing. As with most commodities, there’s a range of price tags associated with video editing software, so your choice will also be influenced by how much money you’re prepared to spend (or what level of license you need). Interface designs are many and varied, with some kind of learning curve generally associated with products at all levels. 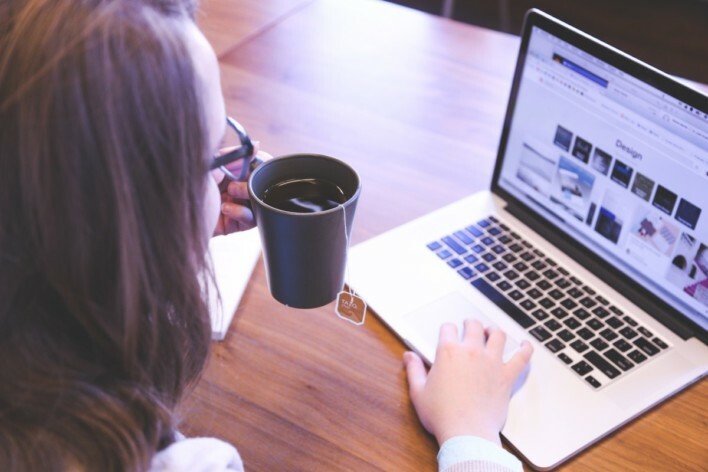 The video editing software package to go for is the one that’s easiest for you to get to grips with and that is compatible with the way you work, and the types of video file formats and video input devices that you typically use. Taking the application for a test run is the best way to determine its usability and performance on your particular system, so look for a video editing software package that includes a free trial, and one that has support resources in the form of help files, tutorials, vendor FAQs, user forums, and the like. Most of the video editing software that’s available online for download now includes features that were previously confined to professional level products, so you’re more or less assured of finding something that’s powerful and well supplied with options and tools. This can certainly be said of the four great video editing software packages that we’ll now describe. Now that you know what you’re looking for, let’s take a look at four of our favourite video editing software solutions for Mac. We’ve put together a handy comparison table so you can clearly see the starting price, user level and license availability for each of the four products that we’ve selected. Below this, you’ll find a more detailed review of each product. Movavi Video Editor for Mac enables you to create films on your MacBook Pro or other Apple computer in a user-friendly video editing software application that requires only “20 minutes to master.” Together with some powerful editing tools, it gives you the ability to export your videos in any format compatible with Mac OS X, including AVI, MPEG-4, and MOV, as well as online uploads to video hosting sites like YouTube, or cloud storage services like Google Drive. Using Movavi Video Editor for Mac, video clips may be cut and spliced with zero loss in quality, and enhanced with filters, special effects, music, titles, and other features. If your filmmaking skills are limited, there’s a new Montage Wizard which automatically assembles and edits the footage you specify into a complete movie. Intel® hardware acceleration assures high-level performance, and speeds up the process of editing and exporting your films. Transfer recordings from photographic or video cameras to your Mac. This includes webcam footage, and microphone-recorded audio. Upload video and audio files in popular formats such as AVI, MOV, MP4, MP3, WMA, etc. Still photographs and graphics files may be added to videos – e.g. as section heading images. Tools for adjusting brightness, sharpness, contrast, colour, and other display settings. Tools for rotating and cropping videos, and deleting unwanted segments. Stabilising tool for editing shaky sections of footage. Magic Enhance, to automatically improve video quality. Over 100 stylish transition effects. Montage Wizard to automatically create movies from your chosen clips. Upload facility to online video hosting sites, cloud storage, and social media. The simple controls and intuitive interface of Movavi Video Editor for Mac make for a video editing software package with a short learning curve that’s powerful, yet easy to master. The 2018 version of Camtasia Studio for Mac (dubbed Camtasia 2018) bills itself as “The Best All-In-One Screen Recorder and Video Editor”, and boasts a user base of over 14 million, including notable organisations like the American Cancer Society and eBay. The video editing software uses a three-stage approach to filmmaking that includes screen recording (capture of regions or complete application windows), editing through a simple time-line, and adding effects for a final polish. 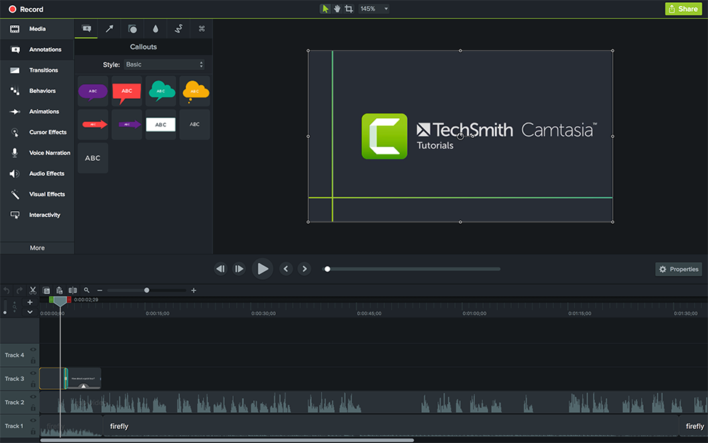 This latest iteration of Camtasia Studio for Mac has refined its editing suite to provide a smoother experience all around. Rendering times up to 50% faster than previous versions are promised – even on the most complex video projects. In addition to screen recording, film clips, images, audio, and even PowerPoint presentations may be imported to a simple time-line that allows you to combine or split your clips, trim them, and speed up or slow down footage. Effects may be dragged and dropped onto the timeline, and there’s a preview mode to gauge how you’re doing. Screen recorder and webcam input. Import of images, audio, video files, and PowerPoint presentations. Multi-track timeline for editing and special effects. A selection of transition effects and animations, audio and visual effects. A green screen feature for advanced overlay effects work. Support for sharing videos directly to popular websites like YouTube and Vimeo. A collection of brand new video assets, including customizable intros, outros, and lower thirds. Camtasia Studio for Mac provides a comprehensive solution for screen recording and video editing in an easy-to-navigate and very user-friendly interface. As far as video editing software is concerned, VideoPad Video Editor is the flagship product of NCH Software, a company that’s noted for producing powerful multimedia editing and management applications that come in remarkably small packages. VideoPad continues this tradition – its installation program comes in at only 6Mb, which is just a fraction of the size of even the smallest of the other applications described here. VideoPad Video Editor for Mac boasts one of the fastest video stream processors on the market, and enables you to edit video from any camcorder, DV camcorder, VHS or webcam. For such a small installation, it has a staggering range of video input file formats, which includes leading standards like AVI, WMV, MPV and DIVX. There’s also a wealth of transitions and visual effects, and the ability to import and mix music tracks or make your own custom movie soundtrack. A range of output formats for video, audio and still images are available, including DVD, CD, Blu-ray or HD-DVD, AVI, WMV, MPG, 3GP, MP4, and MOV. 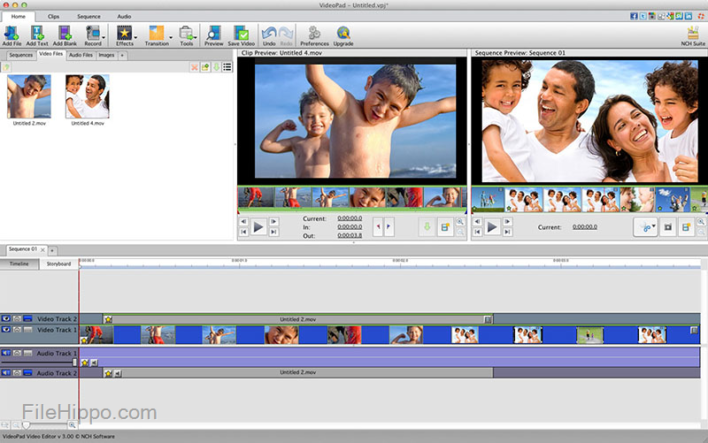 VideoPad Video Editor for Mac will run on any desktop system using Mac OS X 10.5 or above, and there’s an iPhone / iPad version of the video editing software which runs on iOS 6.0 or higher. Ability to drag and drop video clips for easy editing. Support for virtually all popular video formats. 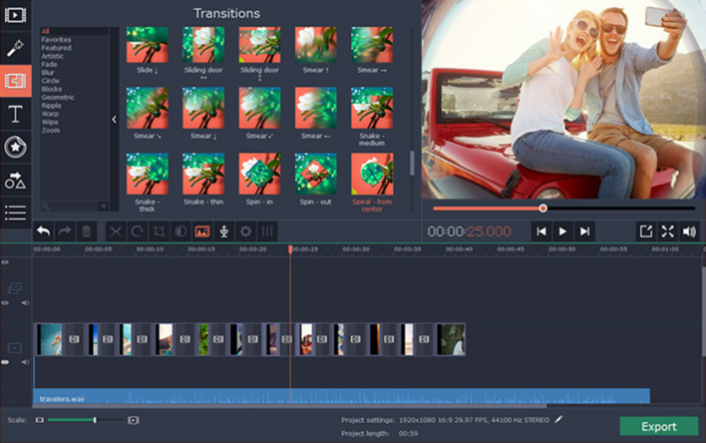 A wide range of video clip transitions and effects. Video speed adjustment, 3D video editing, and 2D to 3D stereoscopic conversion. Overlay text for captions and movie credits. Tools to record your own narrations or use sound effects from the free Sound Effect Library. Includes and integrates with MixPad multi-track mixing software for audio mixing and making your own custom movie soundtracks. Export tools for burning films to DVD or sharing them online or directly to Facebook and YouTube. Ability to export movies in multiple resolutions including full HD, 2K and 4K. VideoPad Video Editor for Mac packs a powerful and comprehensive set of video editing software and audio mixing tools into a small installation that presents itself via a clear and intuitive interface that’s easy to use. A word of caution, though: VideoPad Video Editor will fire up your default web browser (without asking you) when it first installs, and occasionally thereafter. It will also attempt to automatically download (“on demand”) any extra tools that it needs while you’re working, such as video codecs and filters. If you have a firewall installed, or simply object to this kind of behaviour on principle, you have been warned. 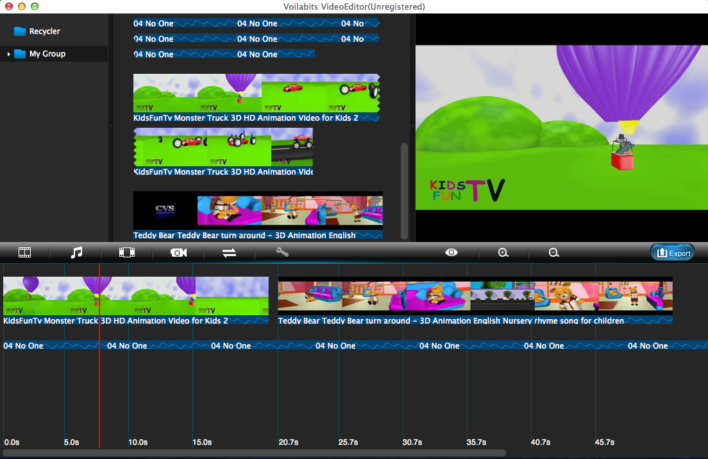 The Voilabits VideoEditor for Mac video editing software is designed for machines running Mac OS X 10.7 or higher. It’s another fairly small package, requiring 20Mb of disk space for the installation, but includes several professional-level editing features. Load video clips from your collection, or record directly. Tools to synchronise video and audio. Quick and easy video editing. Scaling and real-time previews of your video. A range of output formats, including Apple TV, iPhone 6/Plus, iPad Air 2, Samsung, Amazon, HTC, and PSP. Convert between SD & HD video formats including 1080p HD video, like AVI, MP4, WMV, MOV, HD MPEG2, HD AVI, HD WMV, HD FLV, etc. On-board recycler for managing deleted files. Filters and image balancing tools. Voilabits VideoEditor for Mac provides a simple and user-friendly interface for you to quickly and easily create professional-looking movies from your video clips and webcam footage. Whether you’re an experienced filmmaker, just starting out, or simply need the tools to occasionally manipulate digital video content, you’ll find some great video editing software and a host of other applications to download for free, right here at FileHippo. *Price converted to GBP and correct at time of review 19/07/2018.